Wayne Reece earned both thanks to Tidewater Community College’s Job Skills Training Program (JSTP), which held its spring commencement on Wednesday evening at the Roper Center for the Performing Arts. He wanted a good job and a second chance. 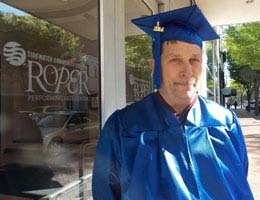 The Georgia native earned his GED in December and the next month enrolled in the JSTP, a comprehensive approach to job training and placement for those with barriers to employment. The JSTP partners with social service and community agencies, the business community and industry leaders to provide counseling, internships, workforce readiness and job follow-up. “I took the culinary arts courses they had available, and it was the best thing that ever happened to me,” said Reese, as his internship cooking at Wickers’s Crab Pot Seafood in Chesapeake turned into a job. Reece said the bad choices that led to a 16-month incarceration that ended two years ago limited his hiring potential, leading him to the TCC program. “He’s a wonderful example of what this program is about,” said Leslie Boughton, coordinator of the JSTP. Reese earned one college credit by completing the program in addition to his national food service manager certification, career readiness certificate and continuing education credits. Thirty-six others graduated with him to the delight of family and friends, many of whom brought balloons and flowers.